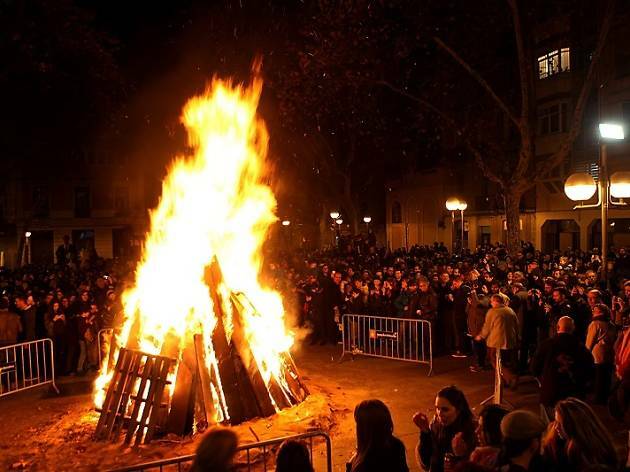 Have you ever wandered among bonfires in the streets of Barcelona in the midst of winter? Have you ever eaten 'morcilla' sausages cooked over an open fire in the middle of the square? If you haven't and you'd like to tick that off your list of things to do in your lifetime, don't miss the 'Sa Pobla a Gràcia' celebration, which is now in its 25th year. Sa Pobla is a small town in Mallorca, where, every year for the feast day of Saint Anthony, they put on an ancestral and traditional party with bonfires, 'xeremiers' who play types of flutes and bagpipes, plus 'zambombas' (friction drums), wandering poetry recitals and singers of traditional folk songs. As a prelude to the party, coinciding with the 25 years of Foguerons in Gràcia, in mid-January 500 residents of the neighbourhood, linked mainly to entities and associations, travelled to Sa Pobla by boat to participate in the celebrations there. In 1993 the tradition made its way to the streets and squares of Barcelona's Gràcia neighbourhood, and ever since, the party has been a reason for natives of Mallorca, Menorca and Ibiza, and other Balearic islanders to come together and celebrate, whether they're just visiting or live in Barcelona. 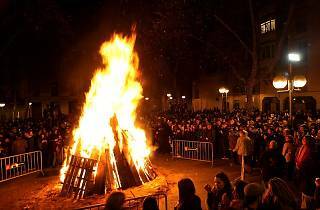 With traditional dancing, food, music, and yes, bonfires in the middle of the street, get ready to join one of the most traditional festivals in Mallorca, without leaving Barcelona. This year the big day is on Saturday, January 28. Things kick off at noon with a session of folk music in the Lesseps, Estrella, Llibertat and Abaceria markets, as well as shows in the Centre de Cultura Popular la Violeta de Gràcia (Maspons, 6). At night activities get underway with the xeremiers and a parade that leaves from Plaça de la Vila at 8.30pm. At 9.30pm, the bonfires are lit and the party really gets started.